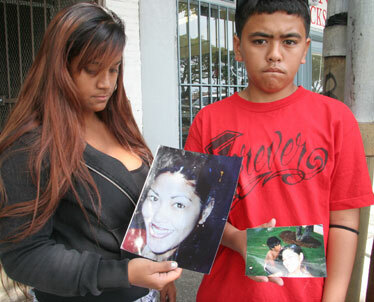 Kalina Badajos, left, a cousin, and Janel Tupuola's son, Kealii Toelupi, held photos Thursday of the fatal beating victim. An anonymous tip led to the capture of a 30-year-old man accused of beating to death his ex-girlfriend with the stock of a shotgun, according to court documents. Alapeti Siuanu Tunoa Jr. is accused of killing Kailua resident Janel Tupuola, 29, a mother of five, Wednesday on Maluniu Avenue in Kailua. Prosecutors charged him yesterday with second-degree murder, first-degree terroristic threatening, first-degree assault, first-degree criminal property damage, place to keep a firearm, felony in possession of a firearm and use of a firearm in commission of a felony. He is being held in lieu of $1 million bail. Court documents said the attack started at about 5:30 p.m. when Tunoa rammed Tupuola's car, causing it to spin out and shut down. Tunoa, who weighs 340 pounds and is 6 feet 2 inches tall, approached her carrying a shotgun and initially struck her with his hand. He used the shotgun to repeatedly beat her in the head with a cutting-type motion, causing her to fall to the ground with severe bleeding, according to Honolulu police officer Kiff Nihipali, who prepared the report. At one point during the attack, according to police, a bystander tried to intervene, and Tunoa told him, "Mind your own business, old man, before I hurt you." The 69-year-old witness grabbed Tunoa's arm, and Tunoa hit him with the shotgun, causing serious injuries, the affidavit said. Nihipali, who was the first officer on the scene, saw Tunoa from about 10 to 15 feet in street lighting, before Tunoa fled in a dark sport utility vehicle. The officer began administering cardiopulmonary resuscitation to Tupuola, who had no pulse. He later identified Tunoa as the suspect, as did four other witnesses. Nihipali said in his report that while searching the Kokokahi area for the suspect, the off-duty officer heard a police alert for a homicide investigation relating to the Maluniu Avenue incident. Police responded to Likeke Place after an anonymous caller reported a large man wearing a yellow shirt and white socks running into a residence there. Police found a dark-colored Ford Explorer SUV in the driveway of 45-002 Likeke Place, blocked by a white Dodge truck. Tunoa looked out the window and was told to exit the house. He carried a water bottle, was covered in sweat and appeared to be short of breath and physically exerted, Nihipali said. Police arrested Tunoa, who identified himself to police, at 6:08 p.m. Tunoa has two robbery convictions from 1996 and 1997.